If that feels like a bit too much to you, however, you might test the waters by mixing prints with a similar color palette, and challenge yourself only with the proximity in scale and texture of the prints. This way, you’re taking a little bit of a risk but not really jumping into the deep end. 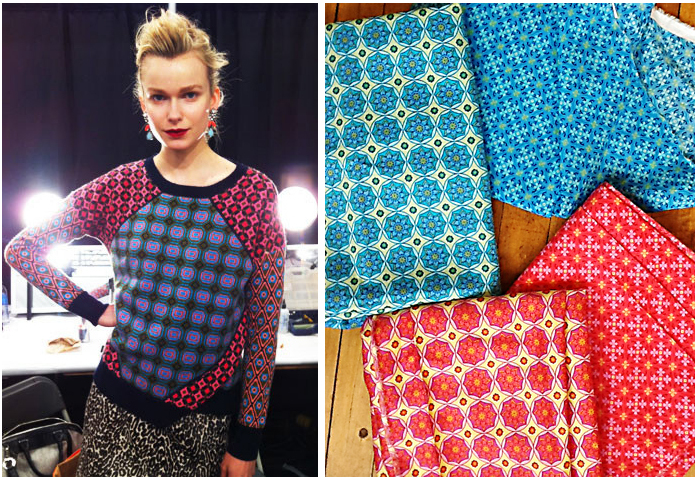 I’ve shown coordinating Lisette sateen and lawn fabrics here, and they could be very cute together sewn up as a Souvenir Blouse so you get the same raglan sleeve effect as the J. Crew top. This could be great for spring and summer! I really like the print combos you suggested. Thanks for the post. This used to be so big when I was in my early 20’s(no where near as sophisticated mind).